Neon yellow dandelions headers already starting to finally peep from the grass. Some of them probably do not even introduces eye, someone might remember how we think of them as children made wreaths and whistles, and there are those who think it is a good way for most rabbits. Big mistake. This plantation can heal and correct the ills in our entire body. Botanical name Dandelion - Dandelion - it speaks for itself. Its therapeutic effects are known to mankind for several millennia. Can fully utilize the whole plant, flower, leaf and root. Flowers not only taste včelkám. 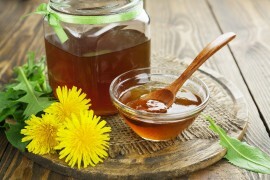 Dandelion syrup or honey from the flowers for us undoubtedly has a long tradition. It helps treat respiratory diseases and promotes expectoration, so it's a great help in diseases such as influenza or tonsillitis. It works not only as a medicine but also as a prevention. Flowers can tear anytime, dandelion flowers usually throughout the summer, in the period from May to October. They can not be dry, nor would rather not try, because there is a risk that she would be room for a few days full of fine white parachutes. The best way to handle it is flowers that honey or syrup. We can then add it to tea, stirred into juice, remove the bread, or use as any other syrup, spoon several times a day. The leaves are rich in vitamins C, A, D, B and beta-carotene, and there are a significant source of silicon, potassium and calcium. They even have a twice higher iron content than spinach. The fresh leaves are mostly doing salad, which is mainly in the spring in the kitchen of some countries their permanent place, or in different salads just adds. Leaves taste such as chicory, that is slightly bitter. Most suitable for direct consumption without drying or heat treatment the leaves are young, with a lower content of white milk. We can think of them from time to time prescribe cleansing for the body and bark while add the necessary vitamins. If after these two weeks we eat every day, a handful of fresh leaves, so purify the kidneys, liver, and improve your digestion. The positive effect will also collect on our skin, cleanses and rejuvenates the skin as well. But beware, pregnant women with such a zest should wait, pregnant women, the use of dandelions in greater recommended. At elevated doses helps induce menstruation. Dandelion is also effective in the fight against eczema, acne and other skin mischief, as leaf and root. It works when used internally, as well as a skin tonic. The leaves can be used as an ingredient in soups, both fresh and dried. Like the flowers, the leaves should tear in the cleanest environment in places far away from the road and avoid the parks and where to go walk the dogs. Drying should be in a thin layer in a well-ventilated room, there is a need here is to turn and shake. Are stored in the dark in a tightly closed container. Dandelion root, it is also a great help for the body. The active substances in the leaves are even more present in the root. Its effects certainly appreciate žlučníkáři and people with poor digestion in general. Supports bile production, and generally has a positive effect on digestion. It is also used in the treatment of inflammatory diseases of the stomach. Another great service is certainly our bodies ability to detox. This should sharpen all smokers, drinkers or any drugs. Dandelion helps rid the body of poisons and toxins that are in us just settle for the above mentioned activities. It's true endearment for purification of our body, the liver and kidneys. But also for the pancreas. Because lower blood sugar, people with diabetes should be with her ​​should quickly make friends. And what about its ability to reduce cholesterol in the blood .. And the good news for tlakaře, this flower lowers blood pressure. We must not forget the joint diseases such as rheumatism, gout and other ailments. Active substances in medical ton prevent degeneration of joints and cartilage and strengthen the entire body building apparatus. Collection and treatment of the root is a little time consuming, than the leaves, but the energy expended to us several times back. The best time to harvest the root spring, and then fall. Root vydolujeme of the country, operas and really clean, cut into pieces and dried in the shade outdoors or in a well-ventilated room. For storage root is particularly important drought that nezplesnivěl, that is, in a tightly closed container. flower - honey / syrup: 400 fully blooming dandelion flowers without stems pour 1.5 liters of water, add 2 sliced ​​lemons and simmer 10 minutes. Let stand for 24 hours, then strain through a cloth to extract add 1.5 kg of sugar, slowly cook on low heat for 1-2 hours (if you want thicker honey, cook longer). While still hot, pour into jars and turn upside down. leaf - tea: 1/4 cup fresh or 1 heaping teaspoon of dried leaves, pour hot water and let steep for 5 minutes.